Single Versus Twin Outboard Motors Which is Better? Conversely, two smaller outboards, each with roughly half the horsepower of this single engine, cost hundreds, if not thousands, of dollars more, weigh significantly more, burn more fuel and have a slower top speed. 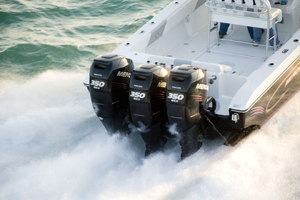 Twin 100s will never push a boat as fast as a single 200 because two lower units double the drag of a single leg. Given the differences in speed, cost, weight and consumption, why would anyone opt for twins? The most common answer ispeace of mind. Theoretically should one engine give up the ghost its faithful twin can be counted on to get you home safely. But what if contaminated fuel that caused the failure? In that case, the reserve engine will die as well. Boats designed for twin power may be so beamy - in the bow as well as the stern - that a single power plant will not overcome the water resistance and will not push them effectively. Substituting a single for twins may also affect a boat's center of gravity, and, consequently, its handling. Sometimes outboard transoms are too narrow to fit twin V-blocks. Even when a dynamic duo can be shoe-horned into the limited space, the propellers may wind up too close together - not that the blade tips will touch, but the wheels may parasitically rob each other of a bite in clean water. Time to plane will be scandalously slow. Some of the newer offshore outboards are narrow V-blocks. Their svelte profiles don't require as much transom space. Additionally, some of today's smaller outboard motors are skinny, inline engines. Two of fit on most boats with room to spare. As long as the twins don't drop total horsepower to less than 70 percent of the boat's maximum horsepower rating, performance will be at least adequate. Besides having a higher price tag, twins effectively double maintenance costs. At tune-up time you'll pay for twice as many spark plugs, fuel filters and twice as much gear lube. Multiply labor costs by two as well. With four-stroke outboards, stern drives and inboards, the amount of crankcase oil and the number of filters must be doubled. If you smash into a reef or other underwater obstruction, you may have to repair or replace two lower units and/or propellers instead of just one. Obviously, there are strong arguments in favor of both single and twin configurations and of all the attendant variations of kicker motors. In the final analysis, though, the answer to the single versus twin question is a personal one. First, what makes you feel good? Another question is whether you have more than one fuel tank (see box). Others are: How well do you maintain an engine? And how far off shore do you typically venture? fuel. When that happens, it doesn't matter whether you run a single or twins, you're stranded. But you can minimize the likelihood of this malady befalling you with a minimal amount of effort. Marinas sell fuel drier, lots of it. Its active ingredients attract water, absorb and encapsulate it. The errant water molecules, held in suspension, flow along with the gasoline to the combustion chamber, where they flash off. Tip: When possible twin engines should be plumbed to draw fuel from separate tanks, through individual fuel/water separators. Note: dding an extra tank may or may not be possible, depending on the design of your boat. Copyright 2007 by Tim Banse. This video shows a Pontoon Boat rigged with a Yamaha VMAX SHO V6 4-stroke outboard motor.